Last week, top executives of multinational and regional companies, leading impact investors, members of government, and international organization representatives came from around the US and the globe to learn from the IDB and each other about how business models for the base of the pyramid can launch and scale quickly and profitably. 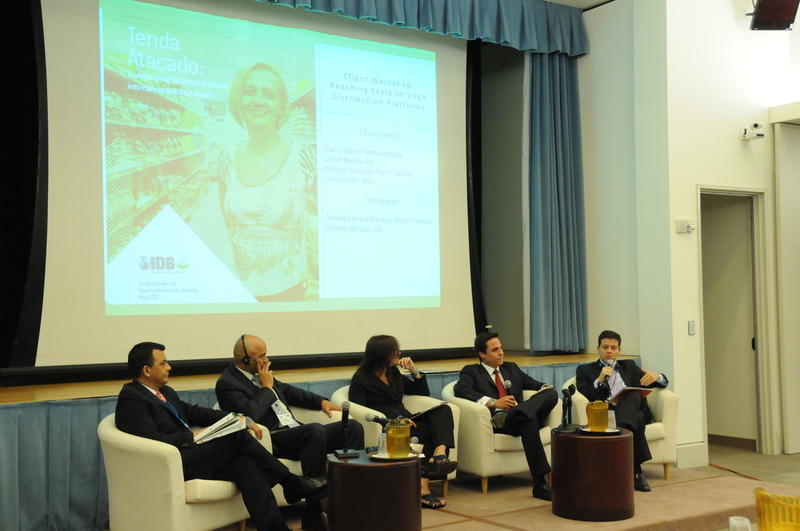 The event was organized by Opportunities for the Majority (OMJ), the IDB department in charge of spotting, nurturing and funding business models to engage base of the pyramid markets on a large scale in Latin America and the Caribbean. OMJ and its partners shared with investors, development experts and business people practical ways to create the right business ecosystems and distribution platforms to reach low-income markets. The event also discussed how business models for the base of the pyramid have become market-based solutions to the region’s most challenging economic and social problems. The IDB and the Global Impact Investing Network (GIIN) kicked off the week with a discussion of impact investing in Latin America and the Caribbean. The Bank was recognized for its leadership in investing in smart business models that might otherwise not move past the pilot stage to make a difference in tens, if not hundreds, of thousands of lives. OMJ had the opportunity to share with participants how it now tracks the difference its projects make in lives and bottom lines through Impact Investing and Reporting Standards (IRIS) an objective measurement that other social investment businesses and impact investors were urged to use. To round out the impact investment discussion, three breakout panels focused on case studies and the nuts and bolts of sourcing, structuring and catalyzing finance and policy in aid of impact investments. OMJ’s fourth annual Strategic Partners Dialogue formed the discussion of day two. Business executives, academics and government officials discussed ways to create the perfect storm within business ecosystems to catalyze business solutions bringing housing and broadband to the poor in Latin America and the Caribbean. Specifically, they talked about how policy innovations—a crucial component of those ecosystems—helped or hindered their work. Juan Sebastian Pardo, CEO of Credifamilia which finances mortgages for homeowners at the base of the pyramid in Colombia with OMJ support, said government policies had allowed his business to start up and to grow. But he called for more government action to scale up further and expand beyond Colombia. Government action to untangle regulations, lower tariffs and encourage competition is needed to bring broadband to more people at the base of the pyramid, said Andres Maz, of CISCO. Applications developed in the region that make money for low-income populations would further spur connectivity, said Colombia’s Communications Minister Diego Molano. On day three, during OMJ’s Client Workshop, three panels discussed using partnerships and distribution platforms to launch models and reach scale in low-income markets. It was a crucial topic: in markets where margins are often low, volume is critical to a model’s success, and company executives stressed the importance of listening to low-income clients to develop and expand those platforms. Each panel contained a CEO from a company supported by OMJ that is successfully reaching the base of the pyramid with an expansive distribution platform. Each CEO, a supplier, utility, and wholesaler, was partnered with an executive from a social enterprise involved in health, education, insurance, and the mobile financing sectors to illustrate how partnerships can generate scale. Luis Velasco of Mi Tienda made a big impression on the crowd when he said it took nine years to pilot the rural supply network that sells durable goods to mom and pop shops in Mexico. The network currently has 6,000 shops and is positioned to expand to 20,000 in the next five years. Ana Cristina Rendon of Colombia’s utility company Empresas Públicas de Medellín (EPM), which uses customers’ utility payment history as a way of establishing and offering credit, said EPM had a platform of over 2 million customers but that its challenge was putting a name and a face to a utility hookup—previously just a number at headquarters. Marco Gorini of Tenda Atacado, a supermarket chain and wholesale distributor that provides credit to thousands of micro-entrepreneurs selling food in São Paulo, said it was important and profitable to keep learning from and about his clients as that can lead to more services—which Tenda Atacado can provide. Mi Tienda, EPM and Tenda Atacado are profitably penetrating low-income markets and shared expertise with audience and panelists still working to crack the code and find the right platform and partner. Smaller social entrepreneurs were paired with larger distribution partners on panels to suggest how installed channels could be vehicles for the goods and services they offer: Vision Spring (affordable eyeglasses) DDDedo (mobile banking) Por ti Familia (diagnostic health services) and AIC, a Haitian insurance company. Results of instant polling at BoP Week showed encouraging results for sharing of information, knowledge, case studies and industry leaders. A third of the participants rated the value of the meetings for their work doing business with the base of the pyramid as excellent, and more than a third said it was very good.